The Reiseanalyse is a survey on the holiday travel behaviour of the German-speaking population. It has continuously been carried out every year since 1970. The survey focuses on holiday travel of five days or more and short breaks of two to four days. 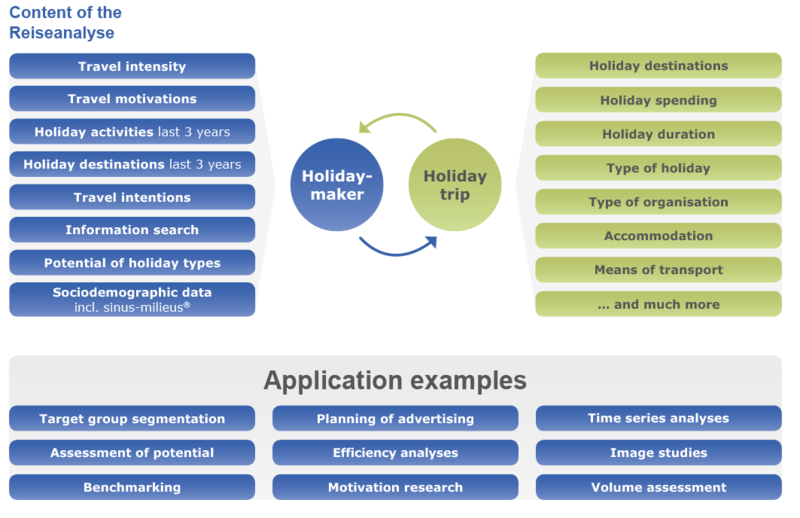 In addition to describing holiday and travel behaviour, the recording of holiday motivations and interests represents a key element of the Reiseanalyse. The future potential of destinations, types of holiday and holiday activities is also covered by survey questions. The Reiseanalyse is a participation-based survey. Survey partners and users of the Reiseanalyse include national and international tourism organisations, tour operators, transport companies, publishing companies, associations as well as universities and research facilities. Survey partners are involved in developing the questionnaire and jointly finance the survey, with the amount contributed depending on the extent to which they use the survey. Find out more about trends in the German holiday travel market. For more information on the structure and methodology of the upcoming Reiseanalyse 2019 please also see our information leaflet RA 2019.